I really want more people to chime in on these decorator threads. Not because of the competition, but because it’s a fun way of learning more about our friends here. I guess we need to find a hot button topic! Which brings me to KonMari, the life changing magic of tidying up. Let’s look at the flip side. What’s the one thing you have the most regret about purging from your stuff? It needs to be a thing, not a person or behavior! I remember being sorry about getting rid of something I couldn’t replace, and feeling an aching sadness about it. But now, many years later, I can’t remember what it was, only the feeling. Maybe getting older has more benefits than we think! Matt or Mods, can you sticky this post for me? Thanks! kind of stupid, but I was just beating myself up about purging something yesterday, so I'll play. LL#1 had a pair of Bearpaw boots - they were basiclaly knockoff Uggs and I think she got them in like 5th grade, before we felt we could trust her with real (expensive) uggs. She wore them for a few years then got real uggs so she stopped wearing them. They were still in great shape and they were real suede, so I kept them around for several years, thinking she could wear them out in crappy weather when she didn't want to wear the real ones. But she never really wore them at all. I tried them a few times but her feet are a little bigger than mine so they were too big on me. So after keeping them around for YEARS -- even pulling them out of the donate pile several times-- I finally donated them to the thrift store a couple months ago. Fast forward to last week, when I get put in an ankle brace for a tendon issue in my ankle. I have exactly one pair of shoes that fits over the brace - a hideous pair of paint-stained fur-lined crocs. It occurred to me that the Bearpaw boots would have been perfect -- tall enough to hide the brace, big enough to fit over it, warm enough to wear in the snow.....but alas....they are gone. So for the last week, I've been rocking my hideous crocs in a constant state of minor annoyance about having donated the boots. Oh well....I figure for every one thing I regret donating there are probably 100 that I never miss at all. This reminds me of an accidental shoe loss. My favorite Keens, black, size 7. Great hiking sandals. I bemoaned the lack of them all last summer and fall. I thought maybe I had KonMari’d them last winter, when we were thinking of downsizing to a condo. Checked the church basement sale in June to see if they had accidentally gone there. And there was a pair of black Keens! Size 8. Not mine. I finally decided that I had accidentally left them in Hawaii. Bought new Keens, not the same style because mine were discontinued. Grumble grumble grumble. Fast forward to December. I pulled the snorkel suitcase from the basement to pack for Hawaii. And there are my black Keens, in the outside pocket. Now I have lots of hiking sandals. D’oh! I don't like to keep a lot of stuff around and can think of only one thing I regret getting rid of some 20 years ago. A beat up Sunbeam Mixmaster, ca. 1955. Mom taught us how to bake starting when we were young. We all took turns, always cooking from the 1958 Betty Crocker Illustrated Cookbook. I got fairly good at it and my sister ended up going to cooking school and then worked at an artisan bakery for several years. We made cakes, mostly. Also cookies, cheesecake, and custards. Brownies. Snow pudding and Floating Island. My sister has the bedraggled original and I received a re-issue of the book as a wedding present. "Dip-level-pour", "The Magic of Chiffon", "The Double Quick Method" - we learned them all from that book. These recipes are all out of date now - too much butter, too much sugar, too many steps. Crazy WW2 recipes that take hours to make, some raised with vinegar and baking soda and buttermilk. No one makes them much any more. But we did, and we made them with a turquoise General Electric hand mixer. The pictures in the book all showed using a Mixmaster and I really wanted one - so cool! You could hold the spatula on the side of the rotating bowl and scrape it down while the beaters were still running! Beautiful rivers of batter forming behind the beaters as it worked - magic! Alas, Mom didn't want one - too bulky and the hand mixer worked just fine. She was KonMari before her time - our house was organized like a military installation. After I moved out of the house Mom found an old Mixmaster (with all of the bowls and attachments!) in a thrift store and she gave it to me for my birthday. By then I had pretty much forgotten I ever wanted one but she remembered. I returned to baking in earnest and Sharon did too. We were pretty much broke in those days and baking something was a fairly cheap way to pass a weekend afternoon. As time passed we used it less and less but always broke it out for holidays and such. The old Mixmaster did yeoman's work for some 20 years, but nothing lasts forever and eventually it quit in a fairly spectacular fashion. Smoke and flames were involved, and although I did find a firm that would rebuild it we got rid of it. 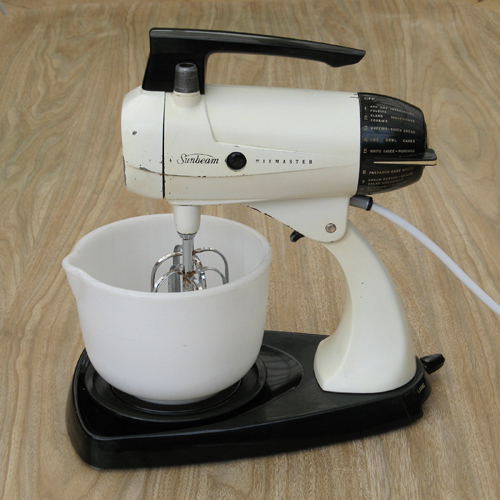 No one wanted old-fashioned Mixmasters by that time - what everyone wanted was a Kitchen Aid stand mixer. I received one for Christmas that year, a little early so I could make Christmas cookies with it. The KA is a mighty beast, capable of churning heavy cookie dough that I would never attempted with the geriatric Mixmaster. Shiny stainless steel bowl, a whisk attachment that produces soft peaks in record time and a dough hook! I've tried to learn to like it but I never have. Sharon doesn't like it much either and now uses a hand mixer. This one is white, Chinese, and sounds funny. I pretty much stopped baking after the Mixmaster died. I've thought about getting another one when they show up on Ebay but I never have. Truth be told, as I moved from my 30's in to my 40's the last thing I needed was to eat more baked goods. I was transitioning from field work to desk work and the lack of exercise was beginning to show. I developed an aversion to sweets after that and rarely eat cake any more. Even so, I regret getting rid of it or at least not replacing it. That crazy thing brought joy that the KA has never been able to duplicate. Maybe I'll get another one when I retire and use it to make unhealthy desserts for my grandchildren. We won't tell their parents. Oh, MixMaster memories! I made a lot of cookies with my mom’s MixMaster. I loved the grooved plate for the two sizes of bowls, and that click of the lever as you changed the position for the different bowls. And the bullet end that twisted to select the speed. I always used a hand mixer after moving out. Thought I wanted a KitchenAid. My mom gave me hers about 8 years ago because she never used it. I never use it, either; it’s heavy to move it when I want to use it, which is not often! So I usually just use the electric hand mixer. When I lived at Bleecker & Bowery in Manahattan I bought mt first nice stereo system: A Denon amp, a Dual turntable, and a pair of honkin' German speakers which I got at an audiophile repurpose store in the Village. I was only a few blocks from Tower Records' huge outlet at B'way & 4th and used to spend many a Sunday afternoon browsing their thousands of classical LPs. I amassed quite a large collection. Alas, by the time I wasready to move to Brooklyn, CDs were in LPs were out. I got rid of all my LPs (except for 2) by putting them out on the curb in stages. Although they are a bugger to move, I wish I still had those LPs. Bernard, cool! We had 3000 LP’s just before second kiddo was born in 1993; they had their own room. We needed a nursery. So we got rid of about 1000 of them (I don’t remember how; they belonged to Mr. AM) and moved the rest to our bedroom. And moved them all to PDX in 1995. We don’t really use them. But we like being able to, when we want to. I wonder if you would use them, if you had them? We mostly stream music now, on Spotify. Through our amp! Or Alexa devices. Random.org picked 2 as my random number, so Steve is the Decorator of the Month for March! Steve, please ping Matt to let him know your selection. Cheers to all, and thanks for playing! Daniel, I was looking forward to hearing your story. Please share, if you’d still like to! Sure! I had a travelling chess set my great-aunt had given me when I was a kid. It was made in the 50"s or 60's. It was functional, practical, and unobtrusive. It had a peg board. It had red and white plastic pieces. I gave to a cousin or something. I've kind of regretted my decision since because I've missed it. Thanks for asking!